The K0264 Micro-Cell Kit comes as a complete kit to which you need only add the working electrode and electrolyte of your choice. 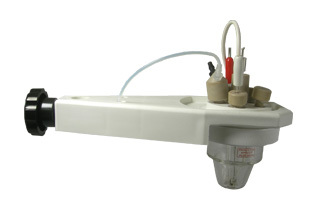 A Pt Wire Counter Electrode and Ag/AgCl Reference Electrode are included in addition to a Purge Tube Assembly that allows for purging of either the bulk solution or providing a blanket purge over the solution during the experiment to prevent atmospheric gases from dissolving back into solution. The Cell Bottom is designed to hold between 3-15 mL of solution and is ideal for experiments in which small volumes are required. Au, Pt, and Glassy Carbon Milli (2 mm ± 0.2mm diameter) and Micro (10µm ± 2µm diameter) Electrodes are available for use as Working Electrodes. Further details can be found under the "Optional Accessories" tab. These microelectrodes have a 10µm ± 2µm diameter disk of electrode material with a fine wire or fiber which is sealed in glass. This enables repolishing of the microdisk and provides an effective barrier against solution leakage in a wide variety of solvents. The electrode body dimension is 8 cm in length and 4 mm in diameter. The operating temperature is 5- 80ºC. These milli-electrodes have a 2 mm ± 0.2mm diameter disk of electrode material with a fine wire or fiber which is epoxied in glass. This enables repolishing of the microdisk and provides an effective barrier against solution leakage in a wide variety of solvents. The electrode body dimension is 9 cm in length and 4 mm in diameter. The operating temperature is 5- 80°C. These “star” bars provide more efficient stirring and fit into the G0057, G0174 and G0193 cell bottoms.